Jamie Harney says Cliftonville’s players must continue to push eachother to be the best they can be as they seek a strong finish to their Danske Bank Premiership campaign. Ahead of tomorrow’s home game with Ballymena United, the 23-year-old central defender – who scored in last week’s comeback victory over Coleraine at Solitude – says it’s important for standards to be raised on an ongoing basis. “We have a bit of momentum building, but the first-half against Coleraine was a reminder that we can’t get too complacent,” he says. “We have to keep on top of ourselves, even though we’ve had a few good results under Paddy and he reminded us of that at half-time and even after the game. You can read the full Harney interview in tomorrow’s edition of our Matchday Magazine, which will be on sale at Solitude for £2.50. 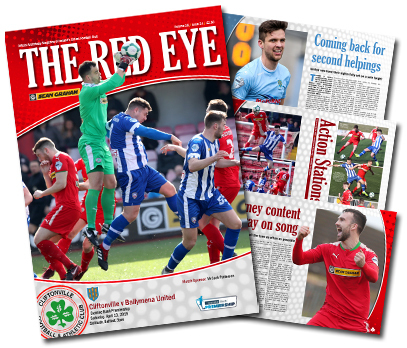 Alongside your latest player poster, The Red Eye’s 24th issue of the campaign reflects on last week’s victory over Coleraine, assesses the Sky Blues’ bid to secure the League’s runners-up berth and steps 34, 51 and 88 years back down memory lane – plus plenty more besides, including an exclusive back-page image that is sure to be of interest to aficionados of all things Cliftonville.